Handling all of the voice processing from the system’s audio interface to the packet interface, and back again. Adaptive Digital’s VoiceAlliance™ Linux based Packet Conference Server is an all-inclusive core set of voice processing technologies, collaborative tools, and signaling protocols which enables Packet-to-Packet Audio Conferencing. Adaptive Digital’s VoIP Engine based Linux Conference Server is a complete VoIP stack solution. In other words, the P2P VoiceAlliance Conference Server handles all voice processing from the system’s audio interface to the packet interface, and back. The LnxVoice SDK features acoustic echo cancellation, noise reduction, and automatic gain control (AGC) for voice quality enhancement (VQE), as well as speech compression (G.711, G.729AB, and G.722 and other optional codecs), RTP and Jitter Buffering. The Linux based Conference Server SDK provides a software framework enabling equipment manufacturers, and/or software developers to easily implement features for sending and receiving multiple audio streams. The VoiceAlliance conference server software stack supports multiple conferences in multiple rooms. The total amount of concurrent conferences is dependent on hardware and bandwidth. *MAX tested – The total amount of concurrent conference instances is dependent upon the hardware. 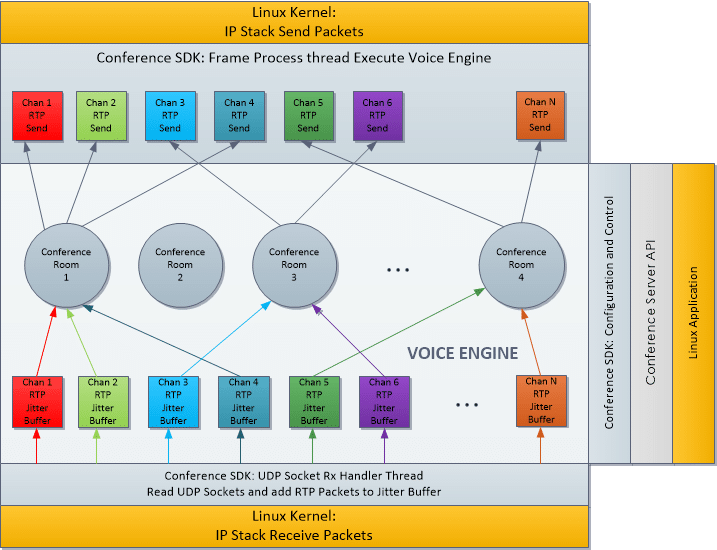 In theory, Linux based Packet Conferencing algorithm supports an infinite number of simultaneous conferences. 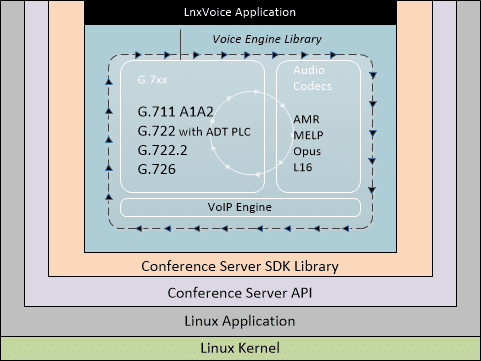 LnxVoice VoIP Engine SDK (includes an evaluation version of the VoIP library, header file and docs). 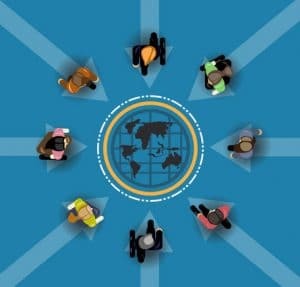 Note: Additionally the P2P Conference server software can be customized to Linux or ARM-Cortex-A platform of choice. The LnxVoice SDK directly interfaces with your system’s ALSA driver and network sockets, taking the difficult part out of VoIP implementations. The kit is designed to get you running quickly. Through the use of a few basic APIs you can configure the system to your liking and easily make and receive calls. SIP SDK for Linux A few simple APIs allow SIP registration, calling, and receiving functionality to be quickly integrated into your project. solution enables the developer to create high quality multimedia conferencing systems whether the product be a web application or end equipment. VoiceAlliance provides the engineer the advantage to integrate the packet conference solution “as-is”, or customize a solution via API on a platform of choice. VoiceAlliance conference server software makes building cross-platform web conferencing system possible. The Voice Quality competes with, and surpasses solutions currently in the market.